A magnetic safety barrier consisting of only two components, that will guarantee easy and fast assembly and disassembly for railway maintenance projects. distortion of the balast bed. 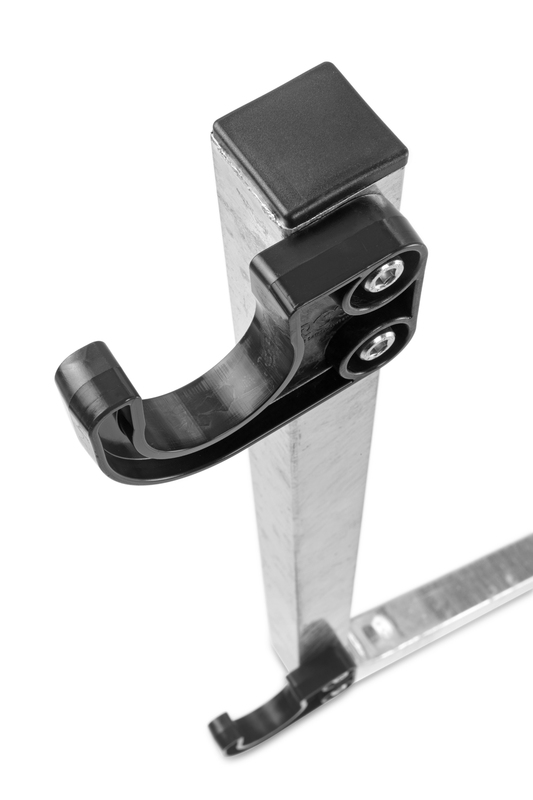 The stanchion contains the Magnet, the heart of the world wide patented system. Together with the horizontal and vertical bar the system is adjustable according the latest standards and norms. The tubes are specially designed and made. The extruded reinforced glass fiber tubes are coated with a coloured film. The tube lock connection is protected against the rough circumstances along the track. Not only the design of a good Stanchion and Tube is important, also the design of the transportation system must be at the same level and completes the success of the Rail Safety System. 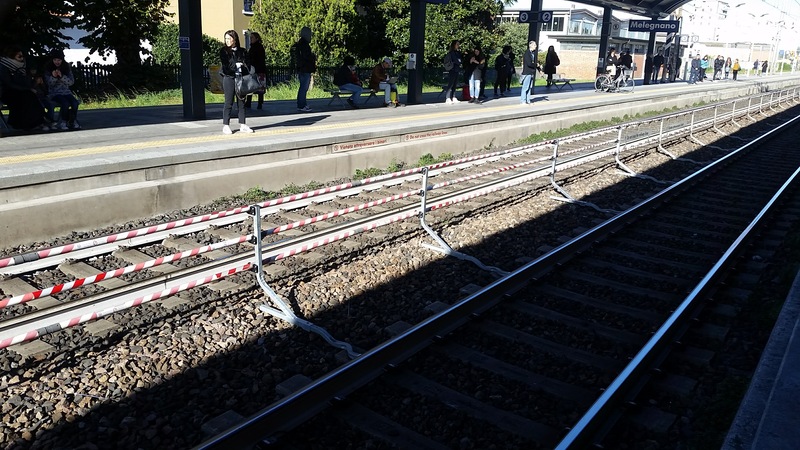 RSS and its Italian distributor Thermit Italia have successfully supplied the first magnetic safety barriers that have been specifically designed to prevent passengers crossing railway tracks. The fast assembly and dismantling of the RSS safety barriers maximizes the flexibility in selecting designated areas for protection purposes. Rail Safety Systems BV and TPA completed a Switch Crossing Safety Barrier demonstration at Stoke on Trent in England for several Clients, on the 17th and 18th of August 2017.RSS and TPA demonstrated to several companies how to build our Magnetically Attached Switch Crossing Safety Barrier over a railway crossing in less than 15 minutes with only 2 persons. Due to this unique world patented system, it is now possible to build a safety barrier across a switch/crossing in several minutes and continue seamlessly with existing Magnetically Attached Safety Barrier to protect the health of the workforce from Silica Dusts and physically from moving vehicles such as Trains and RRV’s. Removal of the system will take even less time. Watch te video on te left. 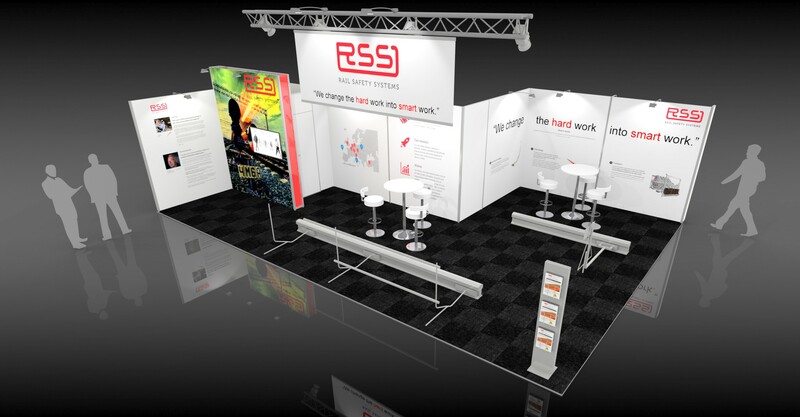 RSS was present at IAF, the International Exhibition on Track Technology, which was held in Münster from May 30-June 1. IAF is by far the largest fair in the world in the field of track technology. With RSS innovative solution by using magnetic safety fences system we have been able to demonstrate the product for our many prospects and customers at our booth. Our most recent development is the possibility of having signs, such as TSR boards, or “Langsamfahrsignale” in Germany attached to the track with a RSS magnetic possibility has also been received with great interest. In Germany we expect the homologation before yearend, following the UK where the first sales have already been completed. For more info please contact our office. RSS was present, in close cooperation with its UK distributor Innovative Railway Safety Ltd, on the Railtex 2017 at NEC Birmingham on May 9-11. Railtex is the all-encompassing showcase for technological innovations across the entire rail supply market. 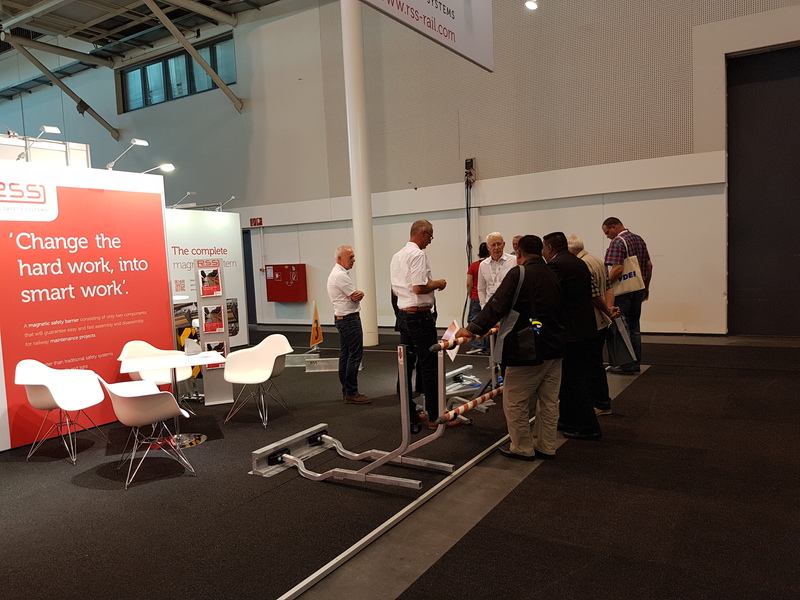 With the RSS stand strategically located , we were able to demonstrate our magnetic safety barriers next to our innovative solutions for TSR boards and signs. It was possible to meet and greet many of our customers and prospects and their enthusiasm confirmed that our presence was not only appreciated but also successful! 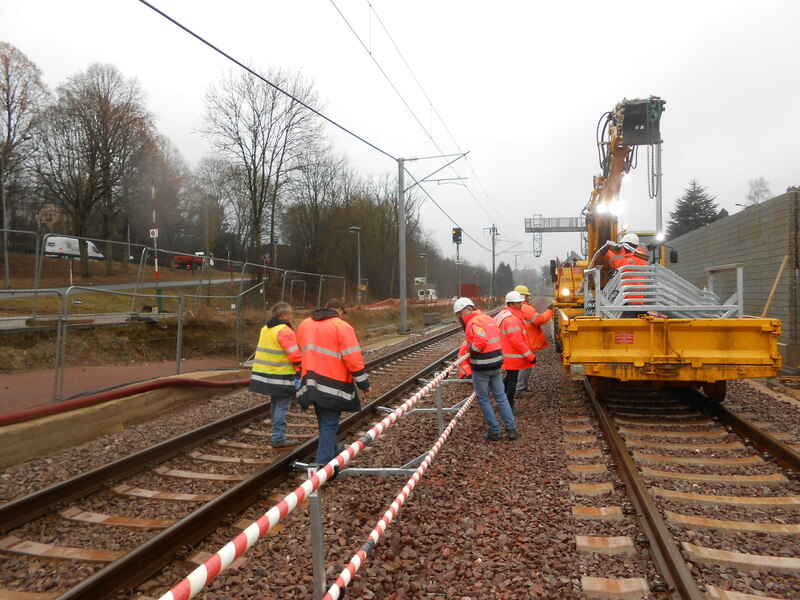 1500 meters RSS Magnetic Safety Fences protect the workers on project Luxembourg-Sandweiler. The project was carried out by a co-operation of 4 Luxembourg contractors i.e., Lux TP, Perrard, Baatz and Tralux. The RSS Magnetic Safety Barrier was supplied by Heli Equipment Belgium. 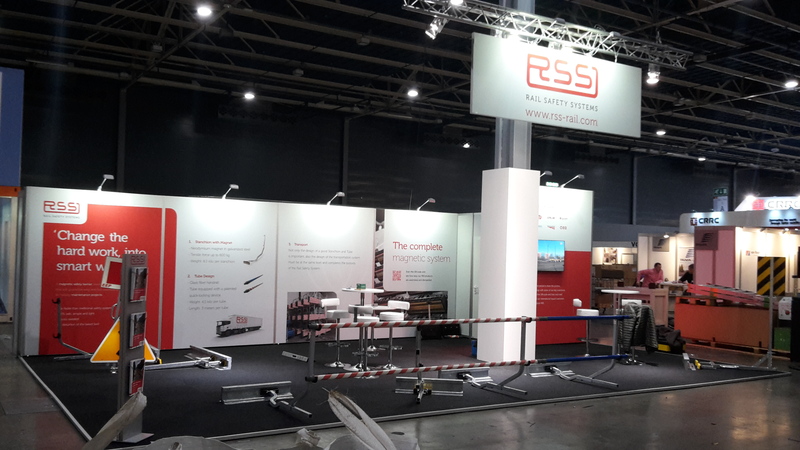 Rail Safety Systems is present at the rail exhibition RailTech Europe Utrecht. From 28 to 30 March you can find us in hall 4 . Rail Safety Systems BV (RSS) was crowned the winner of the Institution of Occupational Safety and Health’s (IOSH) International Railway Group Award 2016, in recognition of its work to create a new magnetically-attached safety barrier. 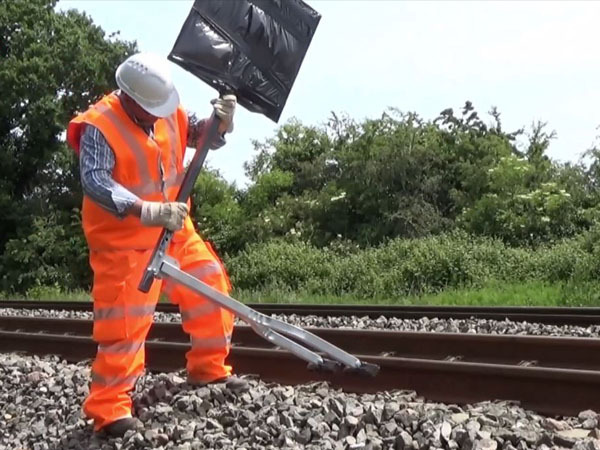 This highly innovative product makes the removal of the ballast beneath the rail track redundant and significantly contributes to eliminating potential health hazards for railway workers. 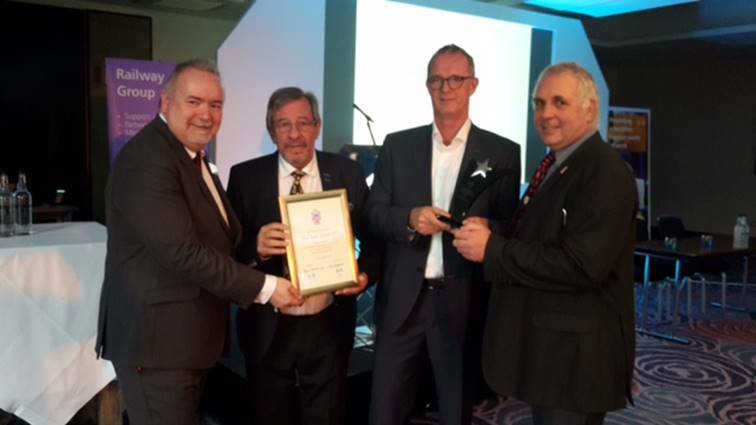 Paul Scapens (second left), managing director of Innovative Railway Safety Ltd. and exclusive distributor of RSS in Great Britain with on his right Jan Bakker, CEO of RSS, receives the IOSH International Railway Group Award 2016 from IOSH president Graham Parker (left), and Keith Morey, Chair of the IOSH Railway Group. These images are taken at Roma Termini Railway station. In this special environment the RSS magnetic fences are not used to protect railway workers, but they prevent the crossing of the railway track by passengers who do not understand the risk of being killed by a train passing by! 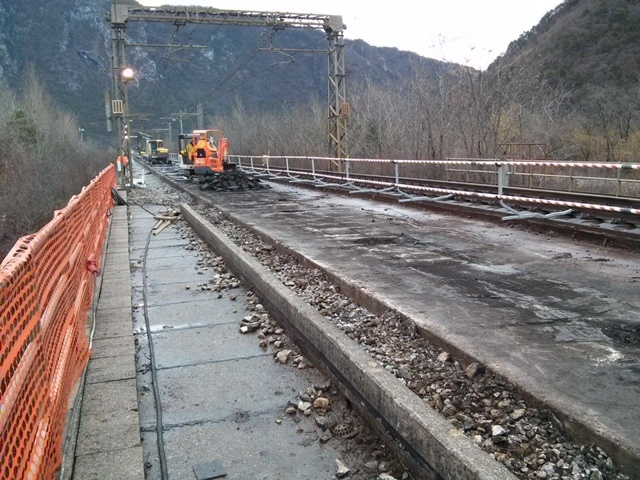 1.200 meters of RSS magnetic fences protect the working area on a RFI large renewal project of the railway Udine – Tarvisio nearby Carnia Station. The Main Contractor is GCF, one of the top customers of Thermit Italiana. The reliable fast installation and dis-installation allows the customer to safely protect the working area easily moving the fence accordingly with the progress of the works. 1.200 metri di barriere protezione cantiere RSS con attacco magnetico alla rotaia proteggono l’area di lavoro in un importante progetto di rinnovamento di Rete Ferroviaria Italiana sulla linea Udine – Tarvisio, nelle vicinanze della stazione di Carnia. L’impresa responsabile dei lavori è la GCF, uno dei principali clienti della Thermit Italiana. 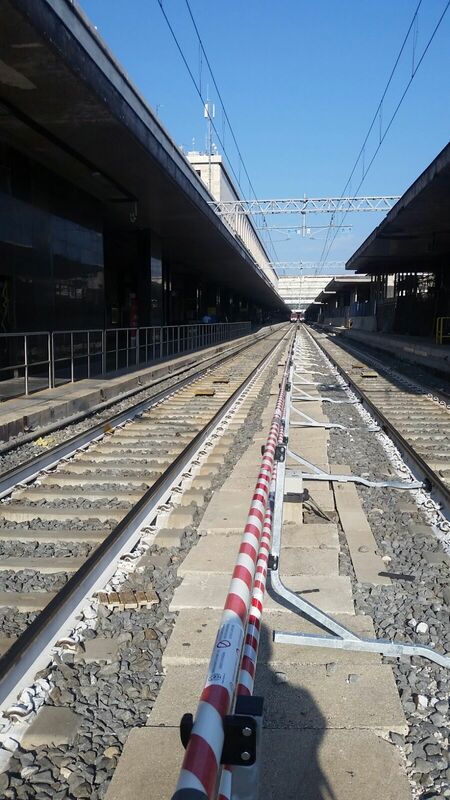 L’affidabilità e velocità di installazione e disinstallazione consentono al cliente di mettere in sicurezza l’area di lavoro spostando agevolmente le barriere così da seguire l’avanzamento del cantiere. RSS Rail Safety System second winner! RSS was nominated for 'most innovative product' at Matexpo 2015. Now we are proud to announce we were awarded second prize in the Innovation category. We would like to congratulate LiUP Liebherr 200 for winning the innovation award! 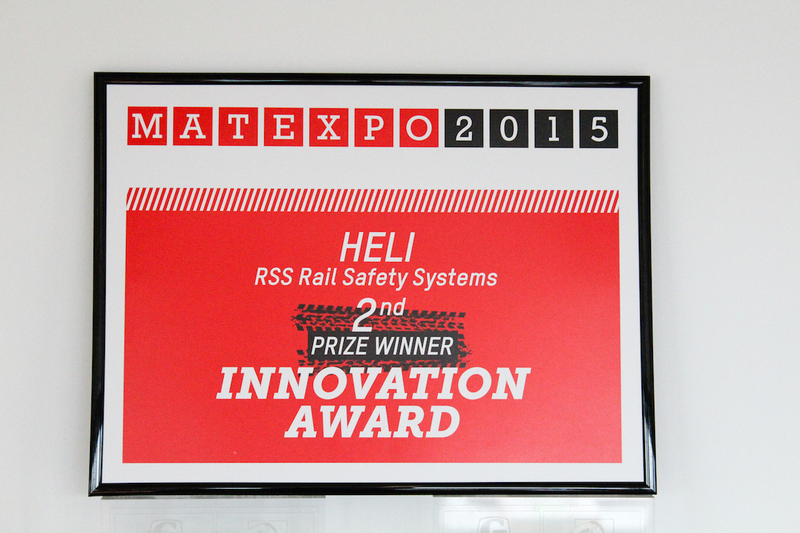 Rail Safety System (RSS) has been nominated for the most innovative product at MATEXPO 2015! With over 40,000 visitors, MATEXPO is Europe’s third largest trade fair with a focus on building equipment. 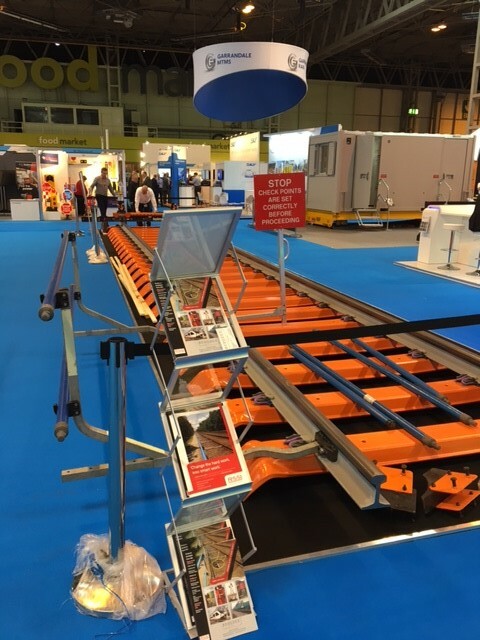 RSS is proudly showcasing the Magnetic Rail Safety System at this established expo. Similar to all great design, simplicity has been built into our safety barriers. 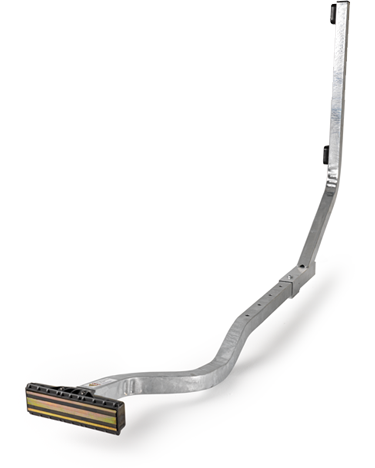 Fast assembly with only two components makes it a truly innovative product for railway maintenance. Watch our video to see just how easy our safety barrier system works. 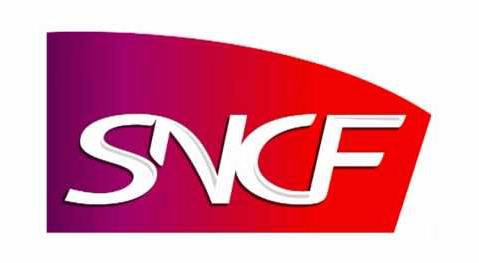 RSS Rail Safety Systems in the news! Our safety system as a prime example for the preservation of railway traffic during maintenance of the railway. See the whole article. RSS winner of THE best idea ÖBB Austria 2014! 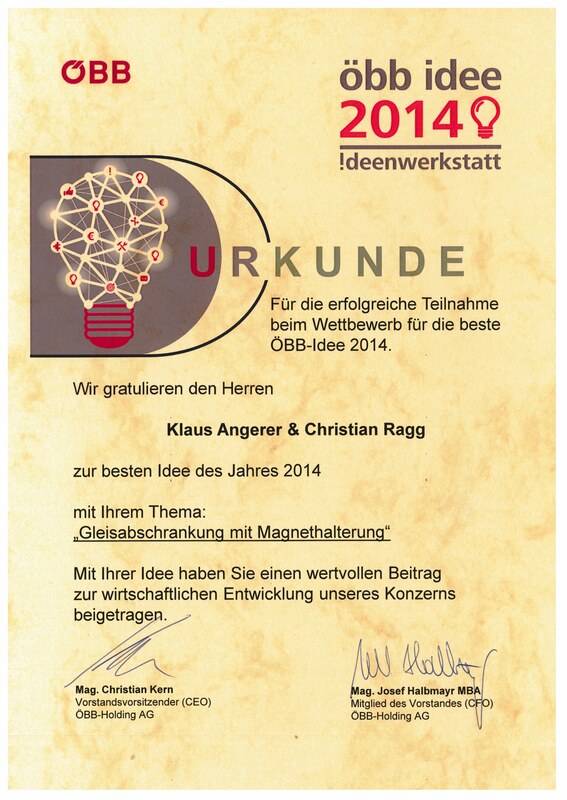 RSS magnetic Safety barrier winner of "THE best idea ÖBB Austria 2014"! Click on the play icon (on the left) to watch a small film of 'the best ÖBB idea. 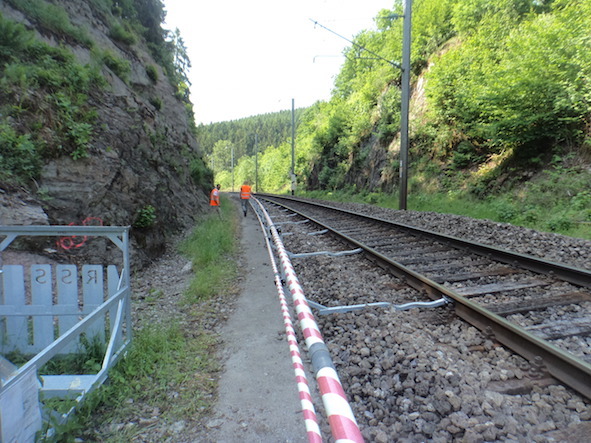 Since September 2014, nine ÖBB sites of engineering work have been using the magnetically attached safety barrier. 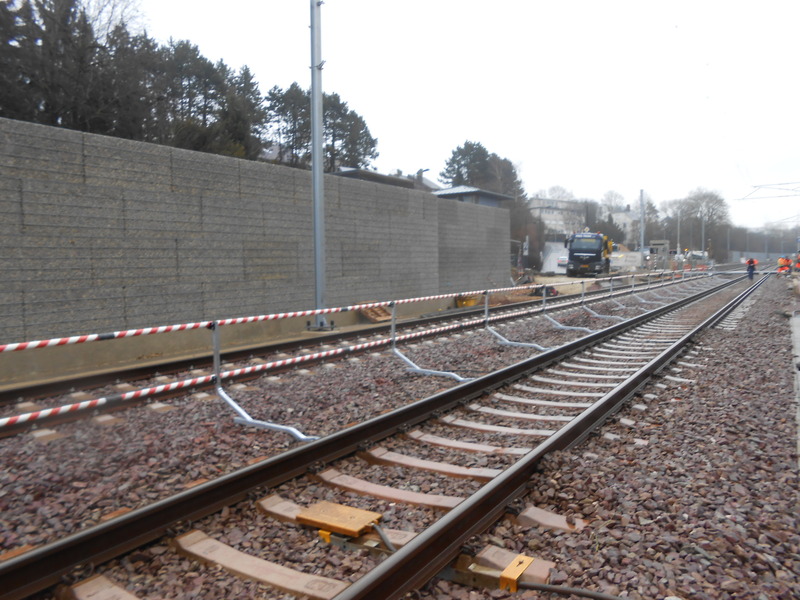 The new barriers are used along stretches of engineering work on single or multiple track lines. The use has thus far proven to be completely effective and is highly praised by employees. After a number of years of investments Deutsche Bahn awarded RSS with a long term distribution contract to be nominated for the exclusive supply of its patented magnetic based safety barrier system. Many years have been spent at research and testing, not only internally at DB but also by external companies such as TÜV to be absolutely convinced the system is meeting the high quality standards of DB and at the same time achieving significant cost reductions in easy and fast fitting or removal of the safety barrier system. RSS is proud to be awarded with this long term commitment and the nomination as strategic supplier. RSS signs significant distribution agreement with the Goldschmidt Thermit Group. 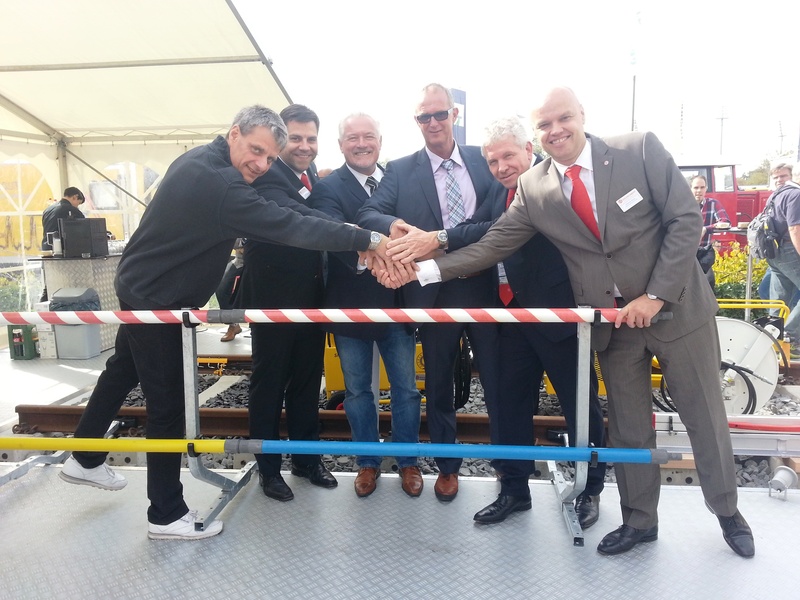 At the Innotrans 2014 in Berlin a distribution agreement has been signed for the exclusive sales of the RSS innovative magnetic based safety barrier system. The Goldschmidt Thermit Group is the recognized and proven supplier worldwide for products and services for the construction, renovation, maintenance and modernization of railway tracks. 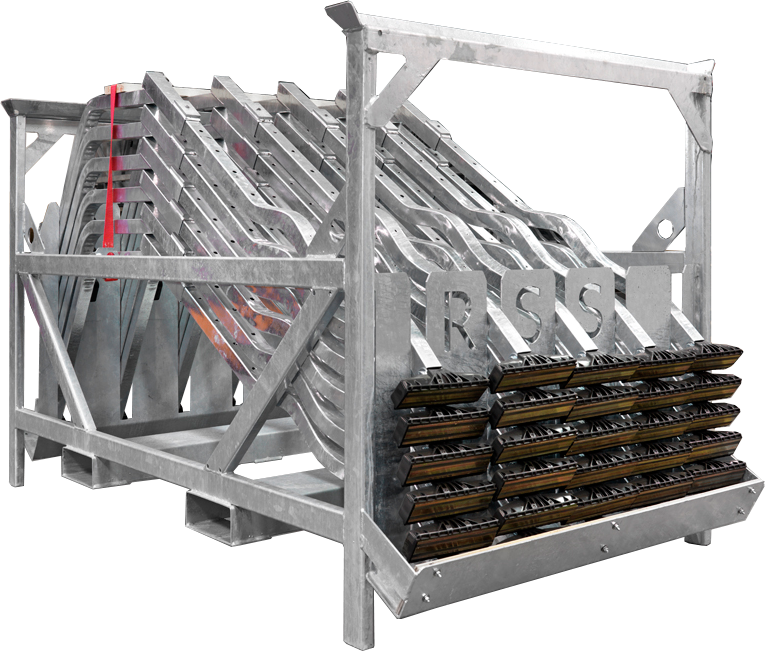 In addition to RSS being active in the main European markets, the Group will further enhance the availability of the magnetic barrier system on a worldwide scale. The CEO’s of both the Goldschmidt Thermit Group and Rail Safety Systems announced at the Innotrans 2014 the importance of this strategic alliance. The German based company emphasized that the combination of the RSS innovative system with GT’s worldwide distribution power is an important step in achieving its mission to do everything better, to improve existing processes and develop new ones. Again an important milestone in RSS rapid market expansion. 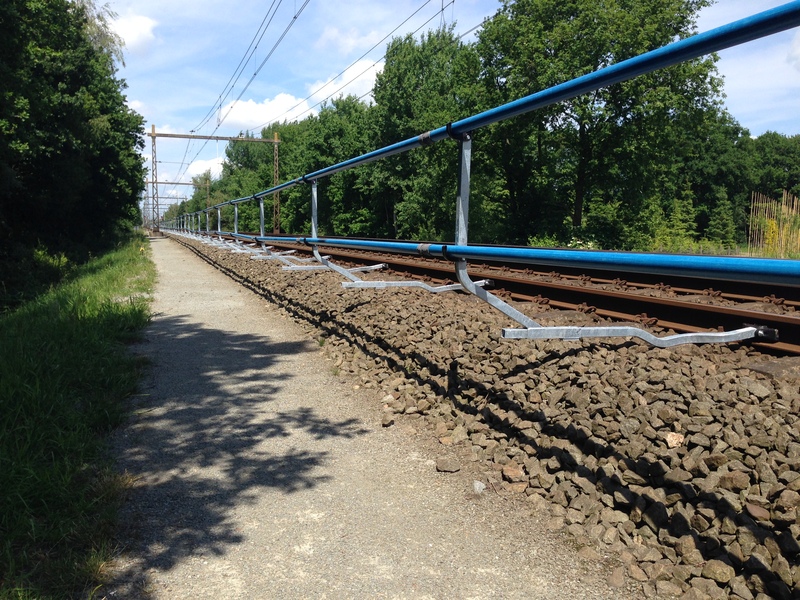 This innovative new concept from RSS in the Netherlands uses magnets to attach the safety barrier directly to the web of the rail. Safety barriers are used to protect rail track workers from moving trains on the parallel track. Safety barriers are the safest way to protect the health and safety of railroad workers, but due to a variety of circumstances traditional safety barriers cannot always be used. 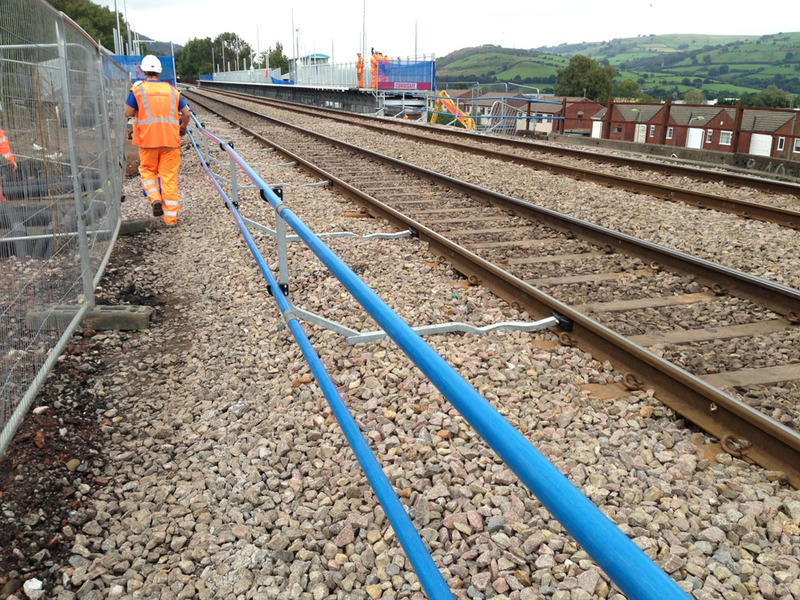 Erection of traditional barriers is time consuming as they require removal of the ballast from under the rail. 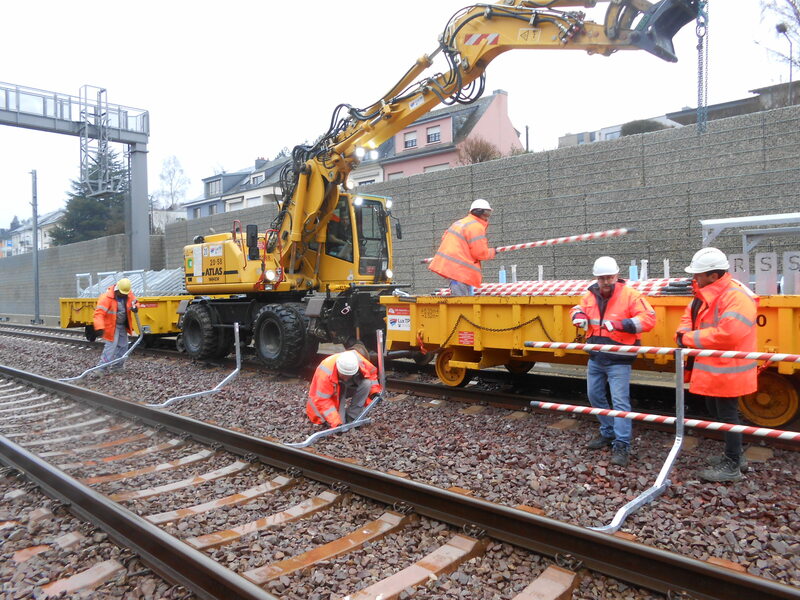 Similarly on removal of the barrier, the ballast has to be re-instated and tamped correctly. Unfortunately due to the above mentioned reasons safety barriers are not always used, and we know that this can lead to incidents, even fatal ones. The TÜV tested RSS safety barrier with magnet has received approval by the Deutsche Bahn and offers many additional benefits to the fundamental one of protecting railway workers. Tests done in the UK by Network Rail, (who incidentally have also fully tested and approved the system for UK rail infrastructure PA05 05085) with a gang of 5 operators showed that it is possible to erect 100 meters of RSS safety barrier in 15 minutes, dismantling took 11 minutes – because there is no need to remove or re-instate ballast. It took 2 hours with a gang of 10 people to erect and dismantle 100 meters of conventional safety fencing, because of the need to remove and re-instate the ballast. Rail Safety Systems obtained the TÜV approval! We are very proud to announce that Rail Safety Systems, after a year of extensive testing, finally has obtained the TÜV approval certificate for our magnetic mounted safety fence to protect railway workers! Besides our European Approval (EN 13374) and the winning of the Innovation award during Railtech 2011 this is probably the most important highlight of the year for RSS. The TÜV approval is an absolute must to be successful in Germany. It also will open other markets in and outside Europe, because TÜV is also recognized there as a standard for safety andquality. The Energlyn project in Caerphilly South Wales is a joint venture between Morgan Sindall and Colas Rail. Having seen a demonstration of the RSS Magnetically attached Safety Barrier by Innovative Railway Safety Ltd of Swansea, it was decided that this innovative solution to workforce protection, together with the obvious time and cost saving implications, should be trialled for the benefit of the railway infrastructure in Wales and the Western Region. Network Rail IP Western division have kindly sponsored the development and trial of the innovative RSS magnetically Attached TSR Board (Temporary Speed Restriction Board). The final part of the trial took place in a ‘live’ situation at Tumpy Green Lane, Dursley, Gloucestershire, courtesy of Network Rail and Balfour Beatty Rail. As you can see in the video, no ballast was required to be removed or replaced, and so the installation and removal of the TSR Board was completed by one man in a 5minute ‘line blockage’, rather than taking a ‘full possession’ with a gang of 5 operatives, saving both time and expense. Initially the sign was twice the size of a conventional TSR sign to give it maximum exposure to the forces (air turbulence) created by the train movement through the air, and ‘black bagged’ to avoid any potential for confusion of train drivers. A Passenger Train at 80 km/h was passed by the TSR Sign initially, followed by the NR Track measurement Train, a Passenger Train travelling at 160 km/h and then a freight train at 120 km/h. As you can see from the video, there was no visible movement or impact on the TSR Board. It remained firmly in position despite being twice the size of a conventional sign and therefore subject to greater loadings. The trial was deemed an unqualified success and the completed RSS Magnetically Attached TSR Board is progressing to full approval by Network Rail. We think that the positive, unqualified approval of the Rail Live Event at Stratford by all those taking part and/or attending was justified and wish to take this opportunity of thanking all those Network Rail Staff involved with its organisation. 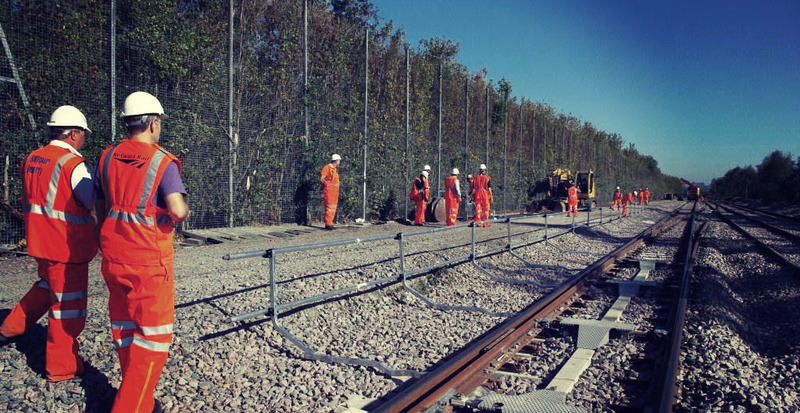 From our perspective, we were able to demonstrate the range of new products: all developed to improve safety, save time and expense; that we have developed since the inaugural approval by Network Rail of our RSS Magnetically Attached Safety Barrier. 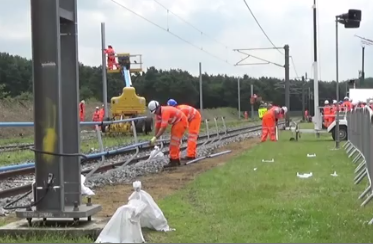 Secondly with the co-operation of the NR Electrification demonstration team, we were able to demonstrate in a live situation, that 4 men could erect 50m of Safety Barrier in 5 minutes and dismantle it in 4 minutes without disturbing the ballast, or incurring the costs associated with a full-possession. It certainly impressed the crowd watching, many of whom had not seen the RSS Magnetically Attached Safety Barrier previously, and were initially sceptical of our claims that “5 operatives could erect 102 m of Safety Barrier in 15 minutes” – seeing is believing! Safe, simple and light, with no hazardous ‘Ballast Dust’ generated. 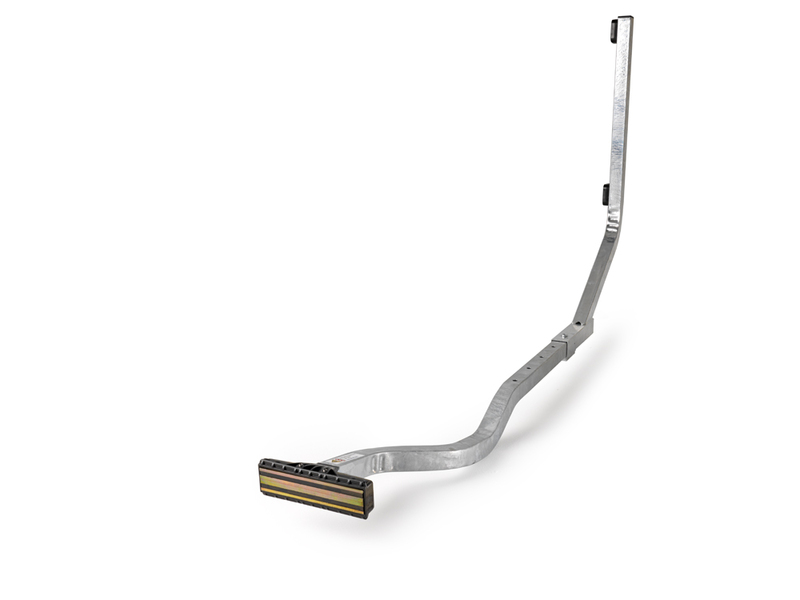 With no ballast removal it can be used in freezing temperatures (to-20oC) when ballast is frozen or in high temperatures (to+80oC) when ‘track distortion’ is an issue. 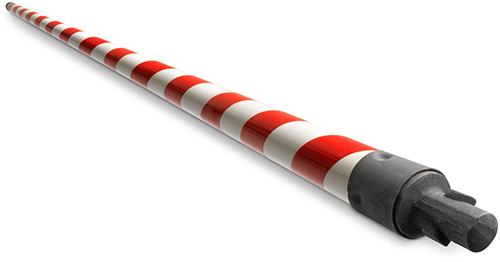 The patented Magnetically Attached Safety Barrier is easy to use and will therefore, be used! faster than some traditional safety system! When I talk to the team today, they usually say: It works, it's relatively simple, I would never have thought so, why didn't we do this before? Click on the play icon (on the left) to watch the full interview or the general Deutsche Bahn Practice video. My name is Philip Glanz and I'm the Senior Area Manager for track maintenance here in the PD Hamm. In the track area, we are responsible for repair and maintenance of the rail systems. We inspect them and replace major components of rail points. Why did you choose RSS? For us there were several reasons. Firstly the cost-effectiveness next to safety. The RSS system may not be the cheapest one on the market, but we save approx. EUR 1000 per shift every time we use it. It is a safe alternative opposed to automatic warning systems that do not prevent employees from walking onto the neighbouring track, and exactly that is made possible by the fixed barriers. What do the savings consist of? 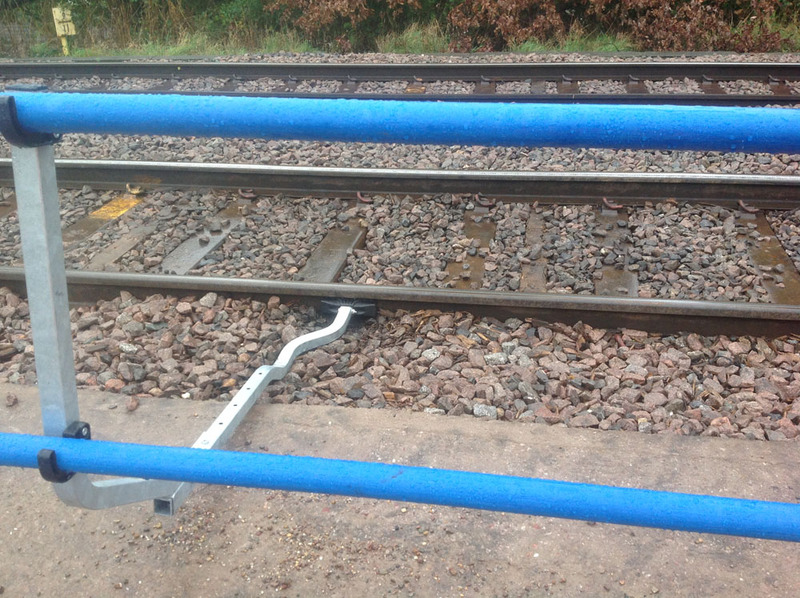 We bought these fixed barriers as DB and they now belong to the depot. When we carry out normal safety procedures we have a service provider who takes over the safety installations for us. We are now saving those costs. The RSS system is a fixed barrier attached to the rail with a magnet. So when compared with conventional fixed barriers, I no longer need to clear the area in which I am installing the fixed barrier from ballast and attach the fixed barrier to the rail. It's much faster, is more simple and I can do it from outside the rail area. That was impossible up to now. How long does it take to build the system? Once the employees have got the hang of it we can manage about 10 metres per minute. So I can build a fixed barrier like the one you see behind me in 5 to 10 minutes. That has been impossible up to now. Licensing of the RSS system. It is often the case, of course, that we are wary of anything new. The biggest risk, or the biggest question raised is: Can a magnet actually hold? Does the system work? Will it not be torn off? What will happen if I lean against it? Is the system stable? RSS provided us with 30 metres for 2 months so we could test it here last year . We tested it extensively with the team; the employees could try it out themselves right here. At the end of the day we realised that the more of the system we build, and the longer it is, the more stable it becomes. To that extent, all the questions or concerns we had raised were actually history. Why did you not choose RSS before? There was no comparable system before. My first reaction was the same as everybody else's when they first see it – “I wish I’d thought of that” – it’s so easy and obvious – only two components. Can you briefly describe your company? Innovative Railway Safety Ltd’s objective is to invent and source innovative products that are used at the GB, Eire and European Railway Infrastructure, with the aim of producing a more environmentally sustainable and safer place to work. We work closely with innovative companies that provide practical, cost effective solutions to both existing identified hazards and those as yet not envisaged but come to light with new technology and working practices. When was your first contact with Rail Safety Systems? 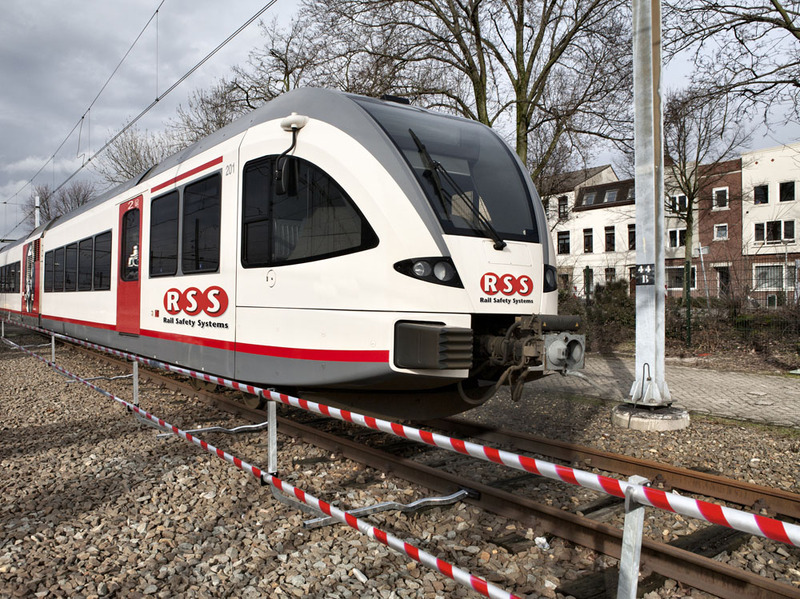 In our continuous search for innovative products, we came across a Dutch company, Rail Safety Systems B.V. who were introducing a revolutionary magnetically attached Safety Barrier System. I joined them at the Rail-Tech Europe trade fair 2011 in Amersfoort Netherlands, where the product won the European Gold Award for Innovation. I was convinced that this was an excellent solution for the market in Great Britain and Eire as well as an opportunity to develop new products utilising their unique magnetic technology (e.g. : Lookout protection Kits, TSR (Temporary Speed Restriction) Boards, Points Run-through Signs etc. The rest, as we say, is history. What was your first impression of the RSS Magnetic Barrier? My first reaction was the same as everybody else’s when they first see it – “I wish I’d thought of that” – it’s so easy and obvious – only two components. I was immediately impressed by its simplicity in attaching to the rail; the fact that no tools were required; the speed of erection allows the opportunity to erect and dismantle in ‘line-blockages’ rather than ‘full possessions’- (5men can erect 102m in 15minutes); it’s light and easily carried; with no ballast removal required, it means no Silica ballast dust or pathogens (e.g. Weil’s disease, Leptospirosis etc.) 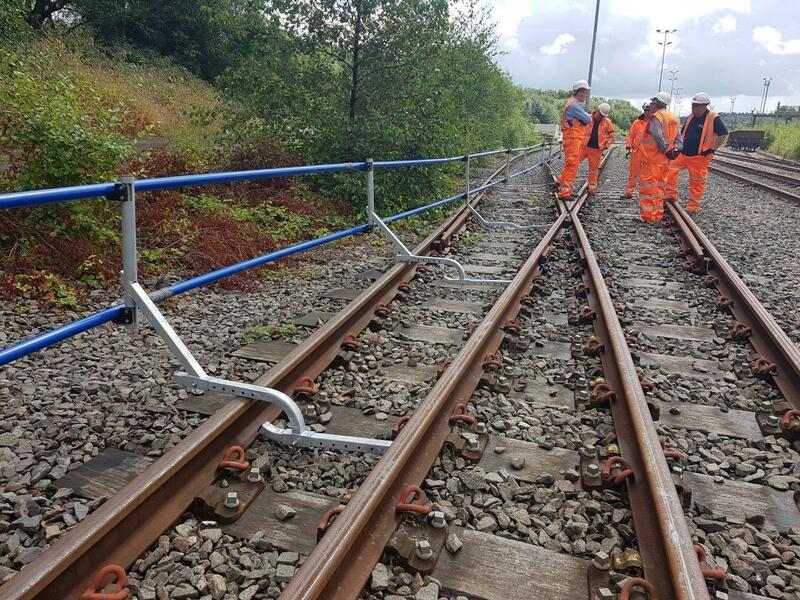 are generated making for a safer working environment; the interlocking the Glass Reinforced Plastic handrails provide a continuous Safety Barrier offering maximum security for operatives working closely to the railway line with train speeds of up to 145mph. In use, it saves Time and as a consequence Money - who would not be interested in this? Do you have an example where the system has effectively been used? Some 24 Km are now in daily use on the GB and Eire infrastructure, so both Network Rail and its Contractors are investing in this new technology and deriving the benefits, - saving time and money. A customer of ours, J. Murphy & Sons Limited, has utilised the Rail Safety System Magnetically Attached Barrier on the Ladbrook Lane project in Wiltshire. This project involved the demolition and reconstruction of a bridge as part of the Great Western Electrification Program. 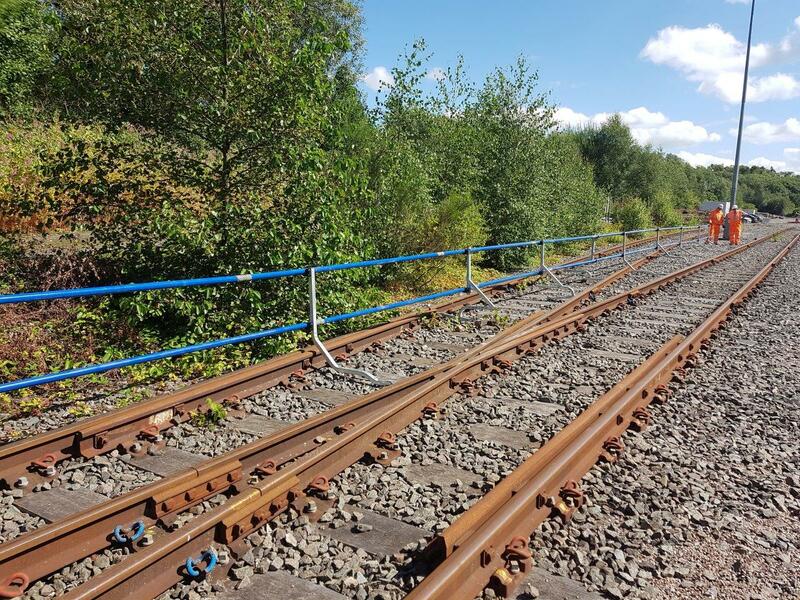 The barrier provided extremely effective protection and enabled work in close proximity to the track to be completed 75% faster compared to traditional barrier systems, resulting in a significant savings – “£1500.00 over traditional Safety Barrier Systems”. See this link. 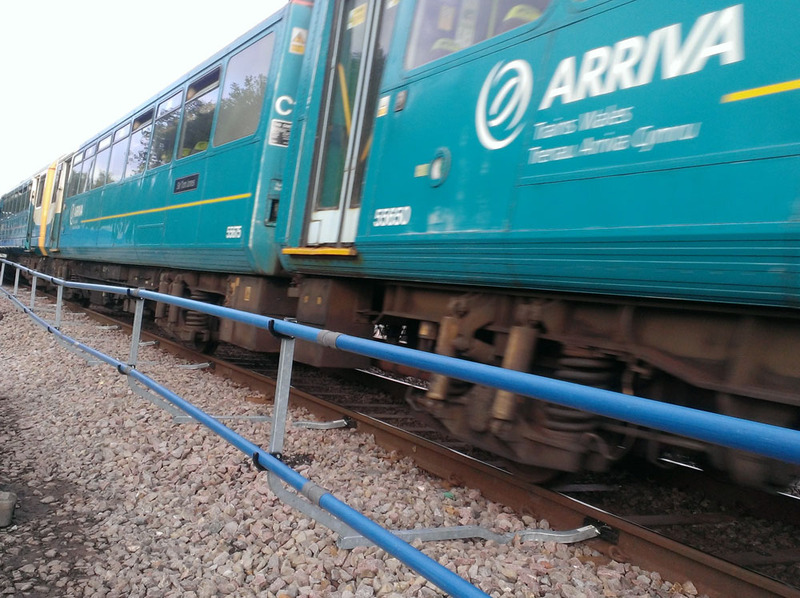 Amey Rail, working with Network Rail on the GWEP (Great Western Electrification Project) were similarly impressed and issued a ‘Share with Pride’ passing on their positive experiences in using the Safety Barrier. See this link. What else can we expect of this cooperation? Our engineers work closely with the engineers of RSS on other ‘new’ innovations, all based around the innovative and patented magnetic system technology. We are in frequent contact with large railway operators, Network Rail amongst them, seeking additional opportunities and will introduce these as we receive approval. There are exciting new products which are in the process of certification and parallel testing and are close to being launched in the GB & Eire and European Markets. For obvious reasons we cannot go into too much detail right now.